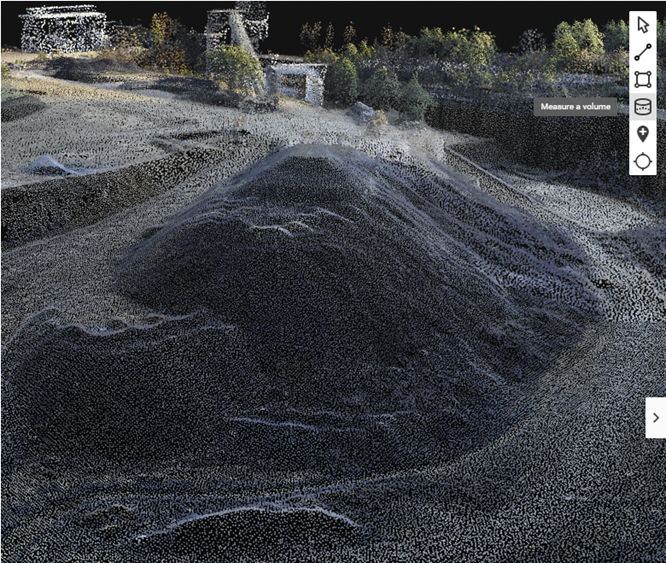 Information: Volumes can be calculated on the cloud with a Pix4Dmapper or Pix4Dbim license. This feature works both for the 2D and 3D views. Alternatively, on the left panel, click to add a new annotation and select Measure a volume. 2. Draw the base surface of the volume that must be calculated, by left-clicking to mark its vertices. With each click, a vertex is created and the volume base surface is formed. Double-click to complete the polygon. 3. (optional) To mark the vertices more accurately, select the volume from the Annotations list on the left panel or click on the toolbar. Correct the position of the vertices or click the plus sign between two vertices to refine the perimeter. 4. Once the polygon has been drawn, specify how the base surface elevation should be determined according to the points of the polygon. By default, a triangulation of all the points is used, but other options are possible. 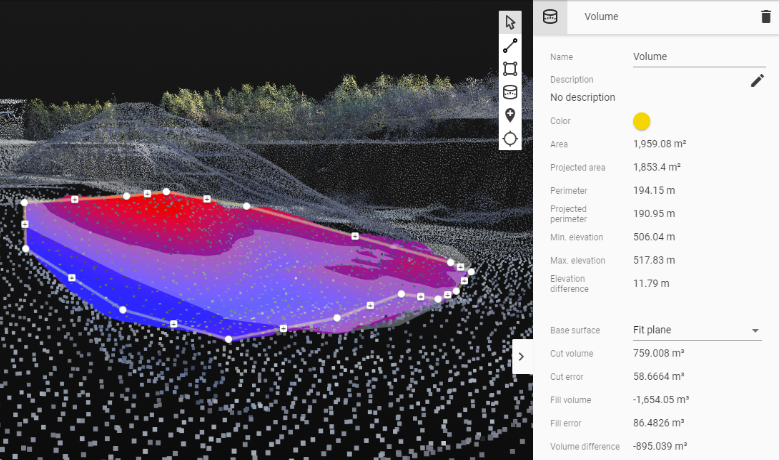 When changing the base surface type, a preview in the 3D view is visible. Tip: For more information on which base surface is recommended to measure your volume: Which Base Surface is recommended for the Volume Calculation? Name, description and color of visualization can be edited. Area, projected area, perimeter, projected perimeter, minimum and maximum elevation and elevation difference will be displayed according to the drawn polygon. Once the base surface is set, click CALCULATE VOLUME to trigger the volume calculation. The volume is always calculated on the DSM, not on the 3D Models. Information: For faster results for large volumes, the computation might be made on downsampled DSM tiles. The displayed calculation errors reflect the downsampling algorithm. The results are displayed on the right panel when done. 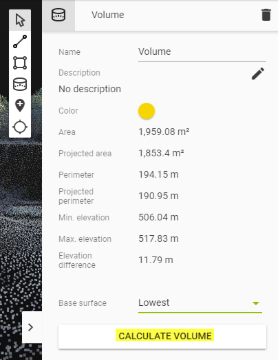 Changing the base surface type and editing the base surface polygon will automatically trigger a new volume calculation. Note: Volume surface displayed with blue areas represents the fill volume, whereas red areas represent the cut volume. Cut volume [units3]: Volume that is above the volume base. The volume is measured between the volume's base and the surface defined by the DSM. Cut error [units3]: Error estimation of the cut volume. Fill volume [units3]: Volume that is below the volume base. The volume is measured between the volume base and the surface defined by the DSM. Fill error [units3]: Error estimation of the fill volume. Volume difference [units3]: Volume difference = cut volume + fill volume. For more information about how the error is computed: Error estimation in volume calculation. 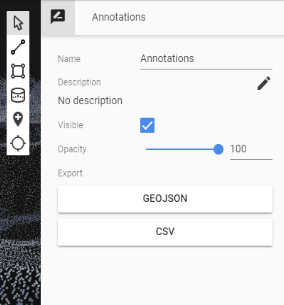 Volume calculations can be exported together with any other annotation as a SHAPEFILE (2D view only), as a CSV or a GEOJSON file. All the volumes in the project are included in the exported file. To export annotations, select the Annotations layer on the left panel and select the preferred export format on the right panel. Volumes can be shared using the link generated after clicking the SHARE button in the upper-right corner. For more information: Can the results be shared?. 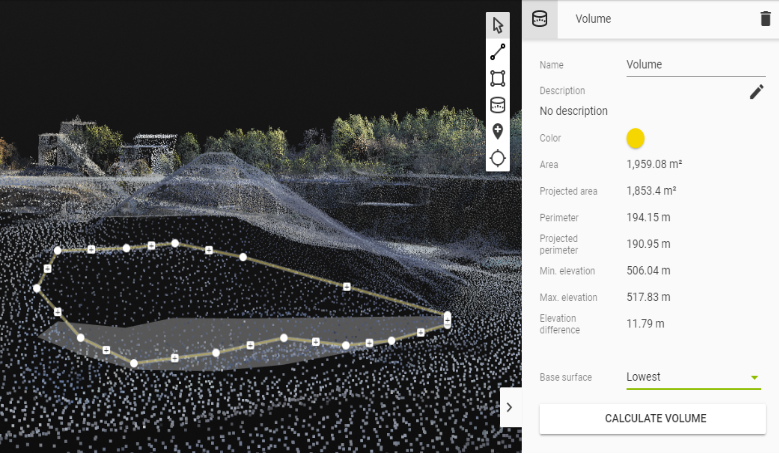 The 3D mesh is uploaded from the cloud interface and the volume is calculated using the 3D mesh as a reference, even if the DSM is available (the base surfaces that are being drawn on the mesh do not intersect any valid region of the DSM. Not having processed the project on the cloud, there is no offset.xyz file that can georeference the mesh). The coordinate system is not one of those recognized as valid. The coordinate system is arbitrary. Which Base Surface is recommended for the Volume Calculation?